Syamsul Yusof's follow-up film "Bohsia: Jangan Pilih Jalan Hitam" outdoes the collection from his previous "Evolusi KL Drift" in its debut weekend and trumps Vin Diesel's "Fast And Furious 4" at the Malaysian box office, proving that local films can still make the cut. The movie has grossed in excess of RM 1.6 million for the weekend just gone (Apr 23-26) according to marketing execs from distributor Grand Brilliance. 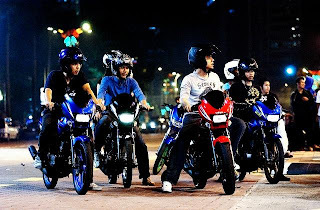 Bohsia: Jangan Pilih Jalan Hitam, which opens in cinemas nationwide, centers on a group of guys who engage in illegal motor racing and hang out with young girls who mix freely with them. Ultimately, all of them pay a price for their follies. This feat is even more incredible given that the film has been slapped with the ominous 18-PL rating, effectively removing a significant portion of the cinema-going market.